Home » Basic Concepts of Stock Analysis » How Many Stocks to Own in Your Portfolio? How Many Stocks to Own in Your Portfolio? One of the common questions that every stock investor faces is “ How many stocks to own in the portfolio?” How many stocks are too few and how many stocks become too many? Too few stocks expose the investor to high risk that under-performance by a single stock would significantly bring down the value of entire portfolio. Too many stocks would spread the portfolio very thin and stellar performance by any stock would have only minimal impact on overall portfolio. Therefore, every investor faces the question of how many stocks to own in the portfolio. Many investors follow different approaches for it. Some investors believe in linking the number of stocks to the size of the portfolio. Others link it to the number of investment opportunities available. Still others link it to the age of the investor. There is no consensus on any way of determining the ideal number of stocks in a portfolio. This article aims to help the investor through this riddle and arrive at the ideal number of stocks in her portfolio. Two stocks from different industries is the minimum number of stocks that any investor should have in her portfolio, to get any diversification benefit to reduce risk. It is believed that more the number of stocks in the portfolio, the higher is the diversification benefit or lower is the risk. However, the rules of diversification limit further benefit after reaching a certain number of stocks in the portfolio, which becomes the maximum number of stocks in the portfolio. Different researchers have proved that the additional diversification benefit, which increases with addition of a new stock in the portfolio, becomes minimal after 20-30 stocks. The above graph from Financial Analysts Journal, indicates that if an investor adds more stocks in the portfolio beyond 30 stocks, it would not reduce any further risk in the portfolio. On the contrary, it would make the portfolio unnecessarily large and the good performance of any one stock would not be able to produce meaning impact on the total portfolio performance. Therefore, increasing the number of stocks beyond 30 might prove counterproductive for the investor. It is, therefore, recommended that an investor should keep the number of stocks in her portfolio within these two boundaries of 2 and 30. Reading the above article would help an investor develop her monitoring framework and estimate the amount of effort it would take to monitor each stock in her portfolio. Monitoring every stock would entail detailed reading of at least four quarterly statements and one annual report every year, in addition to regular reading to news and updates about the company (e.g. Google alerts). The investor should have only as many stocks that she can monitor effectively given the time & effort, which she can spare for her portfolio. Inability to monitor and staying updated about her stocks regularly might present her with surprise developments related to her portfolio stocks and increase the risk. The above guidelines suggest that an investor should try to own as few stocks between 2 and 30, as possible. Having minimum possible number of stocks, if monitored effectively, would provide a healthy mix of diversification benefit without spreading the portfolio too thin and without putting huge demand on investor’s time. 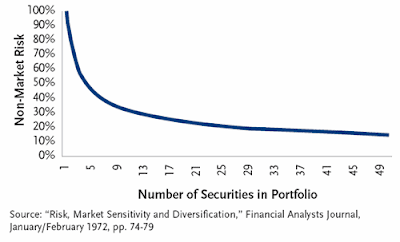 Additionally, during times of crisis/recessions, diversification seems to have failed to provide any real benefit. Investors would remember that during the market decline of 2008, almost all the stocks irrespective of the industry they belonged to, fell in tandem. This hard lesson was learnt earlier in 1998, during Russia, Brazil and East Asia Crisis, when a prominent hedge fund, Long Term Capital Management, witnessed its more than 6,500 investment making losses simultaneously. The fund had to be bailed out by others. Therefore, the attempt of an investor should be to own the minimum possible number of stocks, as per her convenience, comfort and availability of spare time. I suggest the investor to diversify the portfolio as much that she should not lose her peace of mind by being overly concerned about it. If owning 100 stocks makes her feel comfortable, then she should have it. However, this article is aimed at conveying the message that the diversification benefit of 30 or 100 stocks is almost the same. On the contrary, larger number of stocks would hurt portfolio performance, as any good performing stock would be able to have only a small impact on the overall portfolio returns. Step 1: Always, first look for opportunities in the existing stocks in the portfolio. It is assumed that the investor has bought her existing stocks after doing detailed research and has monitored performance of these companies over the years. Therefore, she knows these stocks more than other stocks in the market. If any of the stocks in the portfolio provides good investment opportunity, than the investor should prefer investing in it rather than searching for a new stock every time she has surplus money. “Research & Analysis” section of this website contains live analysis of more than 40 stocks. Reading these articles would be of great help for an investor to analyse her own stocks. An investor should sell the stocks, which are showing deteriorating operating performance for at least two consecutive years. Selling these stocks would purge the portfolio of undesired stocks and lead to a neat & clean portfolio with fundamentally good stocks. Read: When to sell a stock? When the investor realizes that all the stocks in her portfolio are fundamentally sound and have crossed the threshold of putting additional money, then she should start the search of finding a new stock to be added to her portfolio. She should always keep in mind that addition of every new stock is going to add to the time & effort required to monitor the portfolio effectively. Therefore, she should always try to keep the number of stocks in the portfolio to the minimum possible. Number of stocks should be between 2 to 30. Portfolios having any number of stocks more than 30, do not offer any additional benefit in terms of risk reduction than the portfolio with 30 stocks. Number of stocks would depend upon the time & effort the investor can spend on effectively monitoring the stocks in the portfolio. A full time investor can afford to have more stocks in her portfolio than the investor having another full time day job. An experienced investor can afford to have more stocks in her portfolio as she can monitor her stocks effectively by spending less time than a new investor. It is assumed that a new investor would need more time to understand the quarterly & annual reports and thus might not effectively monitor a large portfolio until she gains the required expertise. Once the new investor feels comfortable with her monitoring framework, then she can enlarge her portfolio without diluting the monitoring quality. The argument above might go against the common perception that new investors should have a large portfolio, as they might err while selecting portfolio stocks and a large portfolio would minimize the impacts of their errors. Followers of this argument believe that a large portfolio would have a greater chance of hitting a jackpot. However, I do not recommend that a new investor should have a large portfolio of stocks. A new investor should spend more & more time honing her skills of stock selection and monitoring. Therefore, she should focus on a few stocks at a time. If she has more surplus money, then she should invest it in equity mutual funds temporarily, which would shield her portfolio from her stock selection mistakes in the initial phase. Once she believes that she has learned the art of stock selection & monitoring, and then she can shift her savings from mutual funds to her carefully selected stocks. Therefore, new investors should try to keep their portfolio size small so that they can focus more on the learning aspect of stock investing and learn the higher levels of this skill. Therefore, we can see that it is good for any investor to have the minimum number of stocks between 2 to 30 in her portfolio. The number of stocks in the portfolio is a fine balance between the peace of mind from sudden decrease in portfolio value due to any stock doing poor and the time & effort needed to monitor the portfolio effectively. Therefore, how many stocks to own in the portfolio is an outcome of the investor’s risk appetite, her investing expertise and the time availability with her. How many stocks to own in my portfolio? Thanks Vijay for this wonderful analysis. One thing I want to understand is that how many companies an investor should have in her portfolio. I have around 30 scrips, out of which 70% large cap, 25% midcap & 5% in small cap. Thanks for your feedback! I am happy that you liked the article. How many stocks to own in the portfolio depends on size of portfolio, investor’s comfort and availability of time with her to monitor the stocks in the portfolio. If after reading this article, you feel that you are not doing all the activities required for monitoring then probably you should reduce the number of stocks. When I read statistics, then I learnt that as the number of stocks in the portfolio increases beyond 30, the benefit of diversification from every additional stock is very minimal. So ideally, the maximum number of stocks should be around 30. However, there are investors like Peter Lynch who owned more than 1000 stocks in his mutual fund portfolio at one point in time. But his reason for owning these many stocks was that it helped him in keeping track of these stocks. He in effect kept his watch list stocks also within his portfolio by investing minimal amount in them. I do not select stocks based on market cap. I prefer investing in fundamentally good stocks at low P/E. I find most of these stocks in the small cap segment. I invest in these small cap stocks and do not sell it when they grow and become mid-caps. All the large cap stocks at some point of time in the past, were small/mid-caps. Therefore, I simply focus on buying good stocks available at cheap prices without bothering a lot about market cap. Hope it help clarify your query. I know in the article How Many Stocks to Own in the Portfolio, you have recommended a concentrated stocks portfolio. Can you share what is your views on stock portfolio rebalancing? I am having 5 stocks for past 5 years. We do not advise selling stocks for re-balancing of portfolio, unless the particular stock shows signs of weakness. Selling decision should be based solely on assessment of the stock itself. Any good performing stock becoming a large part of portfolio is not a reason for selling it. Instead, the investor should hold it and reap the benefits until the company is performing well. To balance their portfolio, we believe that whenever investors are buying stocks with additional money, then investors may buy fundamentally good stocks, which are currently in lower percentage of the portfolio so that their portfolio composition gets balanced. We believe that selling good performing stocks should be the last resort to balance the portfolio. When to Sell a Stock? How many stocks do you have in your portfolio? Do you feel comfortable and feel the peace of mind from sudden drop in their value, with the existing number of stocks in the portfolio? How has the number of stocks in your portfolio changed, as you became a more matured investor? Has the number of stocks increased or decreased? How have your views changed about how many stocks to own in the portfolio over time? You may provide your inputs about how many stocks to own in the portfolio in the comments below. Going ahead, I would write about further aspects of stock investing and building a portfolio. Therefore, you may like the blog’s Facebook page, subscribe by email, follow me on Twitter or RSS feed so that you would immediately get to know when new articles are published on the website. Is Industry PE Ratio Important for Investors?